This new corrective serum was created to correct the signs of aging that result from the decline and rapid degradation of the naturally-produced hyaluronic acid in skin. As skin ages, its production of hyaluronic acid decreases. Even at peak production, hyaluronic acid in the skin is depleted by up to 50% every 24 hours. This powerful natural humectant is responsible for maintaining moisture levels in skin, nourishing the skin’s matrix and improving the appearance of firmness, plumpness, and smoothness. Hyaluronic acid begins to decline in the 20s, resulting in minor shadows, fine lines and dullness; but by 50+, the severity of the loss manifests in the deepening of wrinkles, the formation of jowls, skin laxity and rough, uneven texture. As part of an at-home regimen, H.A. 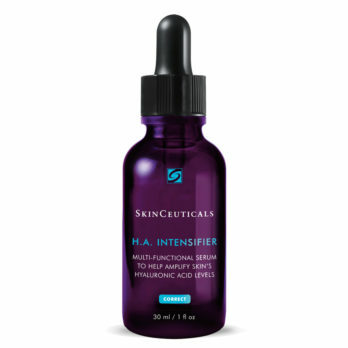 Intensifier can be paired with an antioxidant, sunscreen and other moisturizers in the SkinCeuticals Corrective portfolio to tackle multiple anti-aging concerns. The naturally-occurring enzyme hyaluronidase breaks down deposited HA over time. As with so many other challenges in medicine, it turns out that the most meaningful solution to the problem requires a multi-modal approach. SkinCeuticals have pioneered an efficient, convenient multi-beneficial formulation to support and maintain natural HA levels in the dermis and epidermis. and women. For cosmetic practitioners, talk of hyaluronic acid has largely focused on fillers. Today, the conversation is changing. 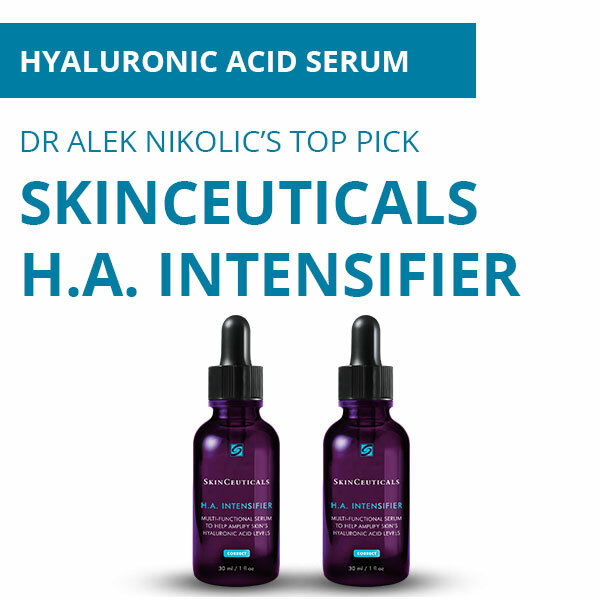 By offering an evidence-based topical solution to the problem of HA depletion, SkinCeuticals offers yet another approach to complement the expert injector. What Is The Role Of Hyaluronic Acid In The Skin & How Does It Change With Age? We know that endogenous or exogenous hyaluronic acid (HA) acts as a great moisturizer. In the epidermal layer, it provides hydration to the skin by attracting water and natural moisturizing factors to the epidermis. This skin hydration is associated with skin elasticity. At the dermal level, HA serves not only as a reservoir for water; by attracting and holding up to 1,000-times its weight in water, it provides structure and volume to the extracellular matrix and allows for the organization of collagen and elastic fibers in the dermis. HA is essential to the structural arrangement needed for proper skin function and metabolism. A healthy extracellular matrix with appropriate amounts of hyaluronic acid will stimulate fibroblast profusion and promote synthesis of new collagen, particularly collagen type 1. We know that endogenous HA levels decrease with age and as a consequence of photodamage. Coupled with other age and UV-associated skin changes over time, this reduction in HA contributes to the appearance of skin aging, including a lack of moisture and elasticity, as well as wrinkling. I hope you found the above article interesting and informative and that you have a clear idea why we should all be using hyaluronic acid in our skin regimes. I recently purchased this serum and I have to say it has made a huge difference in the tone and texture of my skin. My skin is brighter, more even toned, and it glows, even when I wake up in the morning. This product definitely has my vote. Excellent product which has quickly become an important part of my skin care routine.